Quoting is a key process in our sector. It isn’t easy, but customers request quotes as quickly as possible. Often times quoting quickly leads to overquoting and losing the sale. Underquoting entails not hitting the target margin. Therefore, full virtualizations of the process are often done in order to extract the costs, entailing the involvement of technical personnel in the process to optimize the nesting and monitor the process. This usually involves delivery delays and significant opportunity costs. The challenge, then, is to optimize quoting for three factors: precision, speed, and flexibility. And Lantek found the solution. In theory it’s simple. Quoting is about identifying the operational costs involved in placing an order and charging a customer’s corresponding margins. So we reduce the process to two fundamental magnitudes: cost and margin. The problem is that none of them is obvious. The costs are basically related to the correct allocation of raw materials and working times. As we have explained before, it can be a long process that involves technical resources. And at Lantek we want to achieve precision, but also speed. That is why we have developed what we know as Smart Quoting. Smart Quoting is the integration of our products with advanced calculation algorithms. From all the data obtained by our CAD/CAM and our MES, our algorithms are able to extract the necessary information to know, a priori and without simulations, the associated costs of production, with a very high percentage of precision. This implies that we can make estimates without simulations or advanced technical knowledge: precise quotation in minutes. Since we are able to quote simply, quickly, and automatically, why not also have a simple, quick, and automated platform? That’s why we launched Lantek iQuoting, the cloud platform that allows anyone in the organization with access to be able to generate a quote from anywhere and on any device. And when we say any device, we mean any device. Even a piece of machinery. That’s why all iQuoting customers are also able to have a website for online quoting and sales, an e-commerce available 24/7 so that you won’t miss even one sale. We call this Lantek Metal Shop. Margins are another big parameter in pricing. And that margin can be fixed or it can vary based on your customer strategy: you can adjust the margin for high-volume or loyal customers, or you can increase it for new customers, or it may interest you to have a targeted discount strategy... In short, there are a number of possibilities to consider. That’s why it is very common to manage these policies with a CRM that, in addition to organizing the customer and prospectus portfolio, allows pricing policies to be adapted to each case. 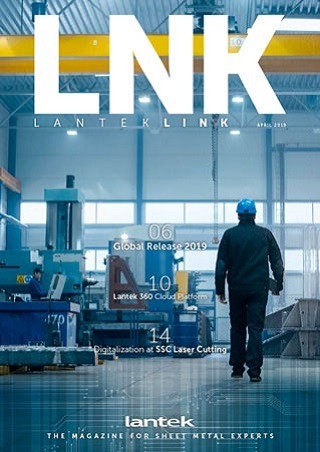 Lantek offers its customers a subcontracting-specialized CRM, a powerful but simple environment to manage customers and prices, one that is connected to costs for quick and precise quote generation. We also offer integration with any CRM the customer may have. For optimal quoting process management, you can’t forget business intelligence. Being able to analyze each quoting process ratio: sales funnel, profitability per customer, material consumption, geolocation... with Lantek Customer Analytics you have all past information at your fingertips as well as all the details on dozens of essential quoting process KPIs. And with Lantek Control Panel you’ll have real-time notifications for each quote request and each accepted order on your mobile device. All the information at your fingertips to make the right decisions for your business.